So over the weekend I went on a walk on a route I take often. The first part is just on the street but then it takes a rabbit trail off to the right and has a path between a beautiful subdivision that runs parallel to an attractive irrigation canal that appears more like a pretty stream because of how it is designed. The path goes on for a while and then opens up into a nice park called, “DeMeyer Park”. Then the path continues and goes back in between more houses the back recreational area of a HP plant that is here in Boise. You have to watch your step while you are walking this path because many people walk their dogs on this path and it always seems to be loaded with poop bombs which keep you paying close attention so you don’t step on one of these land mines. So when I was walking the other day I noticed something that I had not really paid attention to on all my other previous trips. This path is made of asphalt and it pretty thick. But as I walked I kept noticing all these bumps in different places on the path. In some places the bump was bigger and the surface was broken. Everywhere there was a crack there was a weed pushing up through in all its weedy glory. As I observed this, I thought what a feat this was for these down trodden weedple. Some time ago, these weeds or seeds of weeds were squished down flatter than a ribbon under this asphalt. I’m sure there was a time when the weeds were just out there doing their own weed thing in their own weed time, minding their own weed business. Then along came this idea and the plans for this path to disrupt these weed’s lives was set into motion, none of the weeds the wiser. People just arrived one day and starting dumping this hot black sticky black stuff over them and it seemed in an instant, everything changed forever. After they finished dumping they came and they pushed big heavy rollers over them to compact the asphalt even more so it was nice and dense. If that was not enough, in some areas they even used these stomping machines that further packed and shaped the asphalt into place. Meanwhile, deeper and tighter the predicament of the weeds became and the future looked pretty bleak for our weed friends. I’m sure when the path was done and they packed up all their toys and went home, they did not foresee the time when these weeds would rise up again. It did not even occur to them that the weeds could someday overcome all that had been put upon them. But these weeds were tenacious and refused to give up. They knew that this is not what they were made to do. Every waking moment of every day these weeds pressed and pressed up and on while they sang their down trodden song. 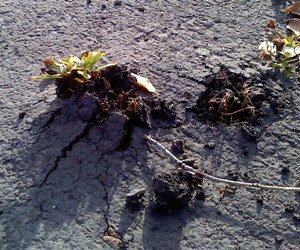 And as they sang their song day after day and cried out to their God for strength to grow on, one day there was a bump on the surface of the asphalt. Each day they continued to put one root in front of the other, refusing to accept their circumstances and they pushed with everything they had. And as they pressed up and on, on the surface the bump got larger and larger and larger until one day…one day…there was a crack on the surface and something hurt their little weed eyes. That something was beautiful, sweet, sunlight and it warmed their cute little weed faces for the first time in what had seemed like forever to them. As the weeds squinted their little weed eyes and adjusted to the brightness, excitement sprang from the very top of their weedy heads to the bottom of their little weedy toes and they began to dance and sing for joy. They danced and they sang a new song about what God had done for them and brought them through. They sang with everything they were from the very depths of their weedy little hearts because they had been delivered out of their captivity and overcome what their enemy had meant to keep them under forever. Some more sassy pants weeds were striking a pose and saying, “Whatta think of me now?” as they flexed their little weed muscles…but most did all the other stuff I mentioned. There are always a few of those in every crowd. You might say they are hard to weed out…or not. Sound a little familiar? No, not the weed part, we all are familiar with those guys for sure and know how tough they really are. But the story…is that familiar? Can you think of a time when you were just perfectly happy the way things were? You were just doing your own happy thing on your own happy time minding your own happy business only to have something or someone so rudely interrupt your happy dance of life? You didn’t do anything to provoke it, most certainly didn’t deserve it but still you found yourself buried under a mountain of hot asphalt, so to speak? I’m afraid this happens to us all only a few times if we are lucky and more if we are not. You may have one day found yourself on the unemployment line or maybe you received some really bad news from your doctor. It may be something with your children or with your spouse or other loved ones. Someone near and dear to you may have been taken from you. There are tons of things I could list here but I think you get the picture. And you get the picture because each and every one of us has been there in their own personal way. All of us have our own story. Some of us can look back at what we have been through while some of us are going through the middle of it right now with no light in sight. It is for those people who this story is really for. The people who have been through a rough time know that you eventually do come out of the other side if you just keep trudging through. Those people can look back and maybe even see that they are better for what they went through. That maybe they have a new perspective that they did not have before they went through their dark time. But for the people in the middle of it right now the good is not easy to see and the sun and Son seem far away. In my opinion, there are a few things that cause us to go through things. And sometimes understanding a few things helps me when times are hard. First I think many things we go through are just the consequences to our own choices…the reaping what we sow thing. A no brainer example would be eating like in the guy in the movie “Super Size Me” indefinitely. If I did this, I would bring on health issues and eventually I would croak from eating so poorly. Would that be God’s fault? It would be no surprise to God but in this example, I did not do the best I could have done with what I had been given and faced the natural consequences for my choices. You see, I have been given free will and God does not intervene with what He has given us. Another thing I see is that sometimes God brings trials on us to test us and to make us stronger or show us where we are weak and need work. What is crucial for us to understand is that the ultimate outcome of anything that God brings our way is for our good and it is always to make us better in some way in the end. Nothing God brings us is meant to keep us down or harm us. It is to refine us and make us more like we need to be, even if we don’t know or think we need it. Then we have an enemy and the Bible tells us that he comes to kill, steal and destroy. But before you run away like a little girl…it also says that we have a Savior that came to give us life and not just life…but life to the full…an abundant life…life to the most…a fulfilling life…a super duper extra ordinary life even. So consider these things for a moment. Jesus came that we might have a full, abundant life. Nothing happens to us that God does not allow. If something gets dumped on us, it may be our own dumb choices, an attack from the enemy or something God wants us to go through, but God still knows about them all. In other things that don’t seem to fall into those categories, still nothing that is happening to us is a surprise to God and He is right here with us. All things if we don’t give up…have the potential to make us stronger and grow us closer to the surface, making us more like who God made us to be…if we will let them. All of these are true statements in my experience. If you are in the middle of something right now, if it feels like you are being packed down and things are closing in around you, don’t lose heart. The sun will shine again. Take an example from what God taught the weed and press up and on with everything you’ve got. Know that God is right there with you and even if you don’t understand anything, the One who gave everything understands it all and is for you and loves you more than you can ever imagine. His word tells you that He has plans for you. His plans for you are to prosper you, not to harm you and to give you a hope and a future. Those sound like plans that will carry us all through any hard time that this life can throw at us. Father, would You wrap Your love around all the people who are going through hard times right this very moment? Would You comfort those who mourn and give strength to the ones who are weary from their fight? Would You heal the wounds of the ones injured in their fight as they have tried to fight on their own strength? Would you give hope to those who have run out of hope and joy to the ones who do not remember the last time they felt You shine on them? And would You let them feel You closerthanthis to them this very second? Isaiah 40:29-31 (New International Version) He gives strength to the weary and increases the power of the weak. Even youths grow tired and weary, and young men stumble and fall, but those who hope in the LORD will renew their strength. They will soar on wings like eagles…they will run and not grow weary…they will walk and not be faint. Jeremiah 29:11 (New International Version) For I know the plans I have for you,” declares the LORD, “plans to prosper you and not to harm you, plans to give you hope and a future. John 10:10 (New International Version) The thief comes only to steal and kill and destroy; I have come that they may have life, and have it to the full.